TAY: Open Thanksgiving Gif Party Forum! Hello everyone, and welcome to the Open Forum GIF PARTY, which is hosted by Kotaku's reader-run blog, TAY. This is a place to talk (and/or gif) about life, video games, or anything else, so feel free to join in the topic discussion, or comment about anything. Then, when you're done, feel free to peruse the articles on TAY, AniTAY and TAYClassic. Is this your first time on TAY or the Open Forum? Then check out this handy TAYTorial! So it's a quiet forum today. I will probably be busy assisting with stuffing, making pumpkin icebox pie, and sweet potato souffle and won't be around much to host. Though I expect it to be vewwy vewwy quiet on the forum today. Unless you non-Thanksgiving celebrating peeps rise up and take over the TAY while the rest of us are cooking/feasting. Be aware I'll be watching you Irish Flowers all! But tomorrow. I'll see all you have done, tomorrow. In fact, why not give thanks in GIF form instead. Let's go with that! Party Gifs, Thanksgiving Gifs, Turkey Gifs, Whatever gifs... Gif it up! 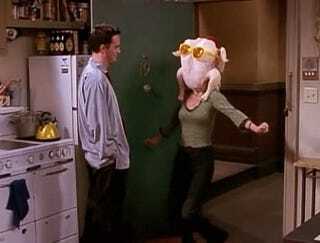 Happy Thanksgiving and/or Thursday everyone! As always, feel free to Talk Amongst Yourselves if ain't nobody got time for Gifs! It is the Open Forum, after all. Don't forget that the IRC Channel is always around for you to carry out discussions as well. If you wanted to give an admin, author, and/or friend a shout: You can find them on the DirecTAYry.